Ricky Hatton: A Life Story is a celebration and promotion of the Mancunian phenomenon that has catapulted himself from council estate youngster to a multi millionaire, for whom it's not money that's the issue but the honour and pride he brings to his home city, his country and the people that populate it. Hatton is a passionate, fearless man of the people whose uncompromising attitude to his sport and life is exemplified throughout this biopic. There are consistent assertions of greatness made from the opening frames when the demise of Ali is presented as the simultaneous with the emergence of the 'little bruiser' Hatton into the world. These assertions hold a certain pathos since the comprehensive loss experienced not just by Hatton but by the whole nation in his recent title fight against Floyd Mayweather. But far from showing this portrayal to be premature and hyperbolic, the very picture of Hatton it paints was exemplified as truth, truth beyond the carefully constructed and controlled presentation of the man that positioned Hatton on a somewhat clichéd level within a known historical, mythological boxing heritage. There is a self consciousness to the construction of Hatton's story – inserting 'revolutionary' and 'new' approaches to the telling of a traditional narrative. To the committed Hatton fan this will be a pleasurable and satisfying viewing experience; enabling them to re-experience and reaffirm many of the already well established mythologies that have been created around the man. But what sort of experience is this for the more general boxing fan or the merely curious viewer who finds this DVD rather surprisingly in their stocking at Christmas? There's a dichotomy to the suggested understanding of the man that immediately intrigues and makes familiar and intimate what normally can only be found in the banal pages of glossy magazines or glitzy and futile 'profiles' of the rich and famous. Hatton's story is told exclusively by those who are closest to him; this, at least on the surface, could not be a more intimate insight into the man. The history and development of the young Richard, as his mother touchingly refers to him, is told exclusively by his father, mother and brother. Intercut with previously unseen family footage of the young Hatton engaging in his first kickboxing and then boxing bouts at the age of nine and ten, the story is engaging, revealing and further promotes the already established myth of Hatton as a man whose loyalties are grounded, lasting and held dear. The viewer is encouraged to join this close knit existence, to share the family's joys and triumphs, to experience their history as they experienced it. The notion of sharing and the appeal to our desire to experience it runs throughout the text – we are given numerous opportunities to engage with the family's most intimate moments; whether it be through the oral tradition of the stories that are told with regularity within family circles, or the viewing of the family album, or the watching of the same family videos that are brought out to the fond and amusing reception that enables siblings and parents to maintain and reiterate their established identity. The viewer is drawn into the story as one would be introduced to a family; there is an openness and a guileless humour to the address that not only engages trust but also a liking for someone who so clearly wants to achieve, achieve within a close knit environment of trust, care, humour and unwavering commitment. A committed Hatton fan could watch this extensive and somewhat drawn out account of Hatton's origins without flinching, but for the more general boxing fan it could be argued that the existence outside the ring is of limited appeal; it is what happens inside the ring that holds the interest and generates the excitement. Does the text provide answers to the real boxing questions – how does he prepare for a fight, how does he feel, what happens in the gym, what does he do, what were the secrets the epic battles he is universally acknowledged to have taken part in and, despite meeting some of the best in the world, conquered? Where is the excitement in this story? Much of Hatton's popularity has been built on the all-action nature of his fighting style; a style that guarantees the gladiatorial drama of the ring. Hatton is reticent to make anything of the risk that this approach to his profession necessarily entails; it is once again left to his family to express their concern for his safety. 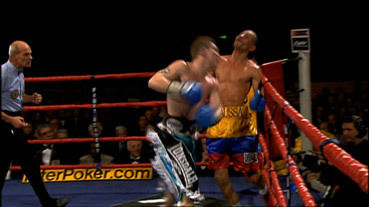 The brutality of the sport is highlighted with a graphic montage of some of the punishment Hatton has taken throughout his career demonstrates the validity of that concern. This negative moment, however, is quickly followed with Hatton's obviously heartfelt motivation for taking these risks; securing the future of his family. Already a rich man, Hatton is obviously acutely aware that his time at this level in the game is short and he must take every opportunity to earn that he can. It is this that drives him and the prospect of losing is what scares him most in the sport. A brave and committed fighter, it is the unswerving determination of the man that is portrayed consistently throughout the biopic, a characteristic that forms a central part of Hatton's success but is also actively promoted within the formation of Hatton's mythological persona. The mid shot seated interview framing highlights Hatton's habitually humorous deadpan delivery and further engages the trust and loyalty of the viewer. Boxing has often been portrayed in a somewhat restricted manner. Apart from such classics as When We Were Kings and Rumble in the Jungle, there have been a number of somewhat predictable variations of the format of introduction, interview, boxing extract, interview and conclusion. Often interesting in terms of a limited engagement with the protagonist through their articulation of thoughts and feelings but rarely does this format do more than present an undemanding, superficial picture dominated by clichéd, mythical attributes of the boxer. The apparent openness of Hatton's story, revealing the tightly controlled family unit that protects guides and shares his unwavering commitment to success goes beyond the predictive into the interesting and engaging. Lengthy and detailed interviews with Billy Graham his trainer and Kerry Kayes his conditioner give any Hatton fan or aspiring boxer a clear picture of the rigour of 'the Monastery' as Hatton likes to call his training camps. All members of the team are also keen to use Hatton's well documented 'ballooning' between fights as further evidence of his fun loving and social nature; Hatton himself is quite comfortable discussing the extent to which he enjoys a well established British social life of beer, karaoke and humour. The determination and absolute focus of 'The Monastery' is clearly what makes Hatton a winner; a source of admiration for all fans and an important lesson for all aspiring boxing champions. It is the honesty of the story that will appeal to boxing enthusiasts. 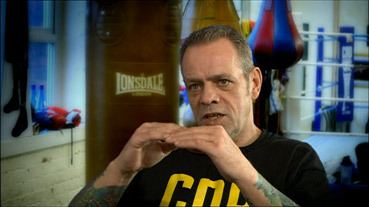 The extent of revelation is clearly controlled to all aspects related to boxing: by the end of the disc the viewer will not have seen Hatton's house, have no idea of the car he drives and perhaps be rather puzzled by the absence of any real input from his girlfriend Jennifer Dooley. It can be seen that in some respects Hatton is an intensely private man and emphasis on the more material gains would alienate 'the man of the people' image that the disc works hard to promote. A Life Story takes a traditional route but makes a conscious effort to extend the viewing experience with some simple but satisfying areas of focus for the erudite boxing fan. A biopic will often frustrate with questions that back off from key issues of personality, barely deal with motivation, reveal the vaguest secrets of training and show much reduced coverage of the fights. There is little more frustrating than a twelve round fight cut down to three or four. A boxing match is a direct conflict of skill within which every second contributes to the outcome. To hack away at the progression of the fight renders the remaining excerpts all but unintelligible. A Life Story recognises this by providing key fights in full as extras to the main text, a feature that makes this disc excellent value for money on its own. Other extras include a round with Ricky Hatton and an extended coverage of his 'Blue Moon' entrance performance. Both sequences build on the established experiential methodology of the disc and invite the viewer to feel the ferocity of Hatton's attack and the awesome theatricality of his entrance to battle. As a biopic Ricky Hatton: A Life Story is worth buying for any fan of boxing; it extends the traditional approach to this genre and gives an insight to the man that has been shrouded in pathos since its sincerity was revealed so starkly on the 8th December. To attempt to joke and play to the crowd in the midst of such a devastating defeat validated the portrayal of Hatton this disc provides. I think the addition of the extras will prove very popular; they are well chosen and showing the full coverage of key fights will enable those who missed the drama to experience it in retrospect. A Life Story is an excellent presentation that reflects an understanding of the boxing public. Shot on high band video with archive footage from a variety of sources including VHS video and 8mm film, the picture looks fine, with no obvious sign of compression artefacts, no mean feat given the volume of extra features on the disc. The framing is 1.78:1 and the picture is enhanced for widescreen TVs. The sound is Dolby 2.0 stereo only, but it's a very clear, well mixed track with good stereo seperation on the music and an impressive dynamic range. I've provided an overview of the extras in the main review, but here is a listing of what's included. In the Ring with Ricky Hatton (3:43) bolts a camera to the head of trainer Billy Graham to give us an idea of what it's like to be in the ring against Ricky. Extracts from this also appear in the main feature. Blue Moon (3:28) is the complete Blue Moon montage used in the film of Ricky's entrance cut with fight footage. Heart of a Winner (7:32) looks at the story behind Danny Seward's song Heart of a Winner, built around an interbiew with Seward and Hatton.